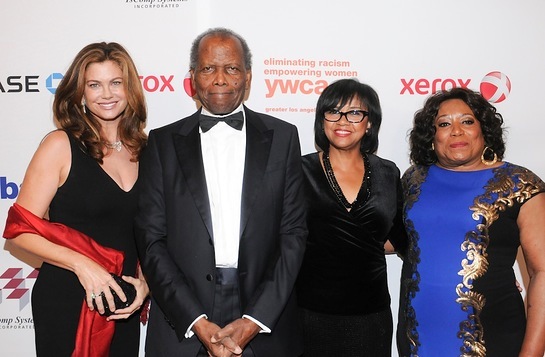 The distinguished presence of the iconic Sidney Poitier, first actor of color to win a best actor Academy Award, who presented YWCA Greater Los Angeles’ coveted Silver Achievement Award to Cheryl Boone Isaacs, first black woman ever to head the Academy of Motion Picture Arts & Sciences and recently re-elected to that presidency, highlighted the 13th Annual Rhapsody Ball funding the organization’s vast and varied efforts to provide services and resources to at-risk Los Angeles young people from lives without hope or opportunity. Faye Washington, President and CEO of YWCA Greater Los Angeles, noted that the pair has contributed “great service in giving minority youngsters the courage to succeed. They are an inspiration to all humanity.” She also conferred the annual Silver Achievement award upon United Way of Greater Los Angeles President and CEO Elise Buik and the Corporate Champion Award, to Xerox Corporation, accepted by Senior Vice President, SBU Operations for Southern California and Las Vegas, Ian O’Donnell. YWCA GLA Ambassador Kathy Ireland, who is a leader of the group’s effort to fight human trafficking and the forced prostitution of girls and young women terrorized into sexual enslavement, began the evening paying tribute to the 120 year old organization’s successful efforts to combat racism and empower women as well as the powerful roles the evening’s honorees have played in those goals. Hosted by the Society of Benefactrix, a special donor circle which supports YWCA GLA programs, the Ball is the organization’s main fundraising event which helps fund YWCA GLA assistance of the area’s most at-risk population, emancipated foster youth facing survival on their own with no resources and minimal training, and other underserved individuals in YWCA GLA’s program areas. Ms. Washington announced that this year’s Rhapsody Ball will fund a new state-of-the-art partnership between Xerox Corporation and the YWCA GLA — The Digital Learning Academy which will provide master training qualifying its graduates with high salary staff positions in Xerox’ quickly expanding 3D printing industry. O’Donnell noted that jobs already are awaiting the trained technicians the Academy will develop. “The honorees for our 13th Annual Rhapsody Ball define the compassionate and inspiring achievement to which the YWCA GLA aspires, turning young lives of survival onto the paths of success,” Ms. Washington stressed. “Cheryl Boone Isaacs is a splendid example of the extraordinary African-American female leadership advances in American culture, art, commerce and, so importantly, social activism. She had shined in her furthering the aspiration and success of one of America’s greatest ambassadors, the motion picture industry, with achievements already honored with her induction into the NAACP Hall of Fame and other distinguished acknowledgements,” Ms. Washington observed. “In 2005,” Washington continued, "Elise Buik made history by becoming the first female president and CEO of the United Way of Greater Los Angeles (UWGLA), and she has expanded on that with her creative and compassionate leadership of that humane undertaking, launching the organization’s 10-year action plan called Creating Pathways Out of Poverty. Jacqueline Bisset, reigning Golden Globe winner, got the evening’s live auction and pledge-giving off to a rousing start by auctioning a lunch offer, triggering an instant bid of $10,000. She then pledged to the YWCA GLA pursuit of its goals a $25,000 donation. The rush of pledges which followed contributed nearly a half million dollars.